For most there’s not much they can do with a guitar amp. You can change speakers and you can change tubes. These changes require a little common sense, a few hand tools and an eye for detail. There is no danger of exposure to high voltages and little chance of breaking your equipment. Both of these simple changes can produce huge differences in tone. Changing a speaker is more complicated and more expensive than changing tubes. Overall, tubes are relatively cheap compared to speakers and in the case of pre amp tubes, no tools are required. The only caution it to be careful with pin alignment and avoid grabbing tubes that are hot. 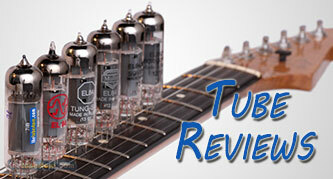 For years there’s been talk of taming different aspects of amplifiers using tube substitution. We have information about this activity on our website at www.thetubestore.com. In an effort to reinforce this information and show you the tangible results of tube swapping we’ve created a short video. – A signal generator is set to deliver a 1,000 Hz signal at 100 millivolts. – The signal is sent to the normal channel of the amplifier. – The amplifier speaker is disconnected and replaced with an 8 ohm 200 watt resistor. – An oscilloscope and digital multimeter are connected across the resistor to measure AC voltage. – The measured voltage is squared and divided by the load resistance of 8 ohms to calculate power. – The oscilloscope is used to show the magnitude of change. The test starts using the highest gain pre-amp, the 12AX7. With that tube installed the amp is turned up to obtain the highest clean output possible. This sets the stage for the entire test. Without changing any controls, pre-amp tubes are substituted one at a time while the changes in amplifier output are observed. The amplifier is powered down between tube changes. The reason for going with a test like this is because our ears can play tricks on us. 2 watts, 10 watts or 20 watts can sound similar as perceived loudness. If you search the net you’ll find lots of information on this topic. Most of it may go way over your head, at least it goes way over my head most of the time. The video removes loudness from the picture and gives you some tangible numbers to compare. The reason that each tube gives different results is not solely based on the gain rating of that tube. Each tube is designed for an application. Part of the design is specific voltage, resistance and capacitance levels for each element. The plate, grid and cathode of each pre-amp need to see these design values in order to function as designed. Amplifier circuits are designed to deliver these values and when you substitute a different tube in the circuit it changes the operation of that circuit and how it interacts with subsequent sections of the amplifier. Because of these effects, you are changing how the entire amp functions and the resulting output. It’s a safe and affordable way to experiment with your tone. But remember; many tubes may be plugged into a given socket, so be sure you know that a substitution is possible before you try it. Our web site lists substitutions that have been proven effective. Enjoy. 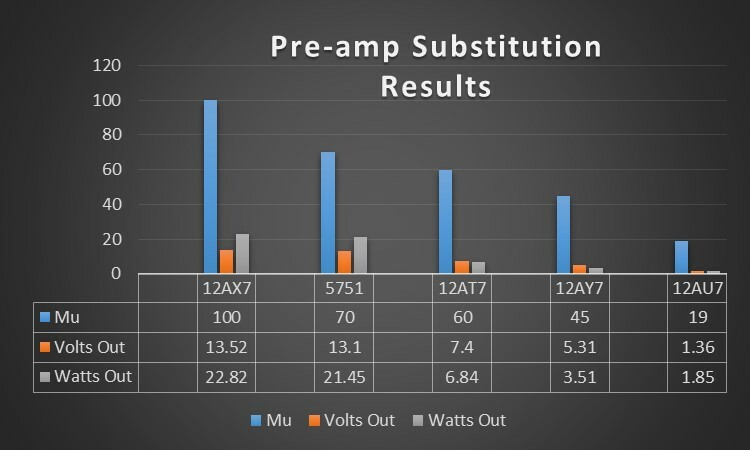 Just a quick clarification: how is it possible looking at 12ax7 and 5771 that we have Mu (amplification factor) of 100 vs 70 and then the power output is pretty similar (22.82W vs 21.45W)?